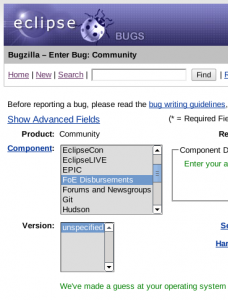 Last year, I blogged about the Friends of Eclipse program expansion that the Eclipse Committer Representatives and I pushed through the board. So as a concrete example, let’s pretend you were a student at university and wanted to host a Eclipse meetup… you could use the funds for food and frosty beverages. Another example would be if you were an eclipse.org committer lead on a project and you wanted to host a team meeting… a proposal could be written to request funds to help that meeting happen. In the end, use the guiding principle that as long as your proposal benefits the Eclipse community in some fashion and meets the rules, your proposal should be fine. On the whole, I hope this program benefits the Eclipse community and also entices people to become Friends of Eclipse to support the community. The more friends we have, the more funds we will have for Eclipse community usage.